In this episode of Leading Lines, Vanderbilt’s Associate Provost for Digital Learning John Sloop interviews three colleagues from Vanderbilt’s Peabody College of Education and Human Development. This fall, Peabody is launching two online graduate programs, a Masters of Education in Human Development Counseling, and a Doctor of Education in Leadership and Learning in Organizations. John talks with three Peabody faculty members involved in the new programs about moving into online education in 2017. Our guests are Andrew Van Schaack, Principal Senior Lecture in Human & Organizational Development and Associate Dean for Online Programs; Catherine Loss, Assistant Professor of the Practice and Associate Department Chair in Leadership, Policy, and Organization; and Paul Speer, Professor and Chair of Human and Organizational Development. You can read more about Peabody’s new online degree programs. Note that this is our last episode of Season 2. We’ll be back in the fall with more interviews exploring the future of educational technology. 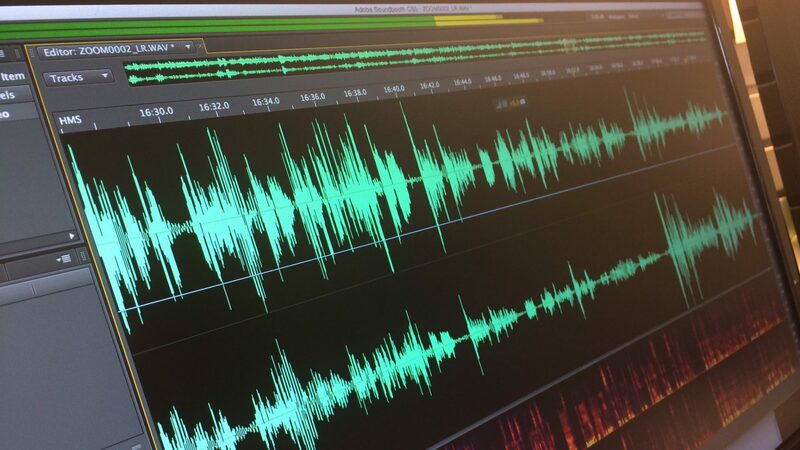 Derek Bruff: [00:06] Welcome to “Leading Lines,” a podcast from Vanderbilt University. I am your host Derek Bruff, the director of the Vanderbilt Center for Teaching. In this podcast we explore creative, intentional and effective uses of technology to enhance student learning — uses that point the way to the future of educational technology in college and university settings. [00:22] This is our last episode of season two of the podcast, and we have something a little bit different for you. John Sloop, who is Vanderbilt’s Associate Provost for Digital Learning, and whom you’ve heard on the podcast several times before, this week interviews three colleagues from Vanderbilt’s Peabody College of Education and Human Development. [00:37] This fall, Peabody is launching two online graduate programs, a Master’s of Education in Human Development Counseling and a Doctorate of Education in Leadership and Learning in Organizations. 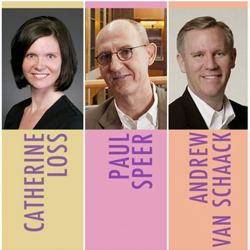 In this episode, John talks with three Peabody faculty involved in the new programs: Andy Van Schaack, Catherine Loss, and Paul Speer. [00:54] Some context. Peabody is a highly ranked school of education, but they’ve never had a fully online program before now. They’re a bit of a late adopter in this space, but they’re moving fast. They made the decision to launch these programs just four months ago. [01:07] It’s important to note in the conversation that follows that the programs haven’t started yet, but it’s a great conversation about what it takes to do something very different for a college in a very short amount of time. Andy Van Schaack: [01:37] Online Programs. John: [01:38] At Peabody College. Andy: [01:39] That’s right. Thank you. John: [01:41] Catherine Loss is Assistant Professor of the Practice and Leadership, Policy and Organization, an Associate Chair. Is that correct? Catherine Loss: [01:47] That’s correct. John: [01:48] Paul Speer, Professor and Chair of Human and Organizational Development. I brought all three of them in today, because we are going to talk about…Peabody is launching two online degree programs this fall, EDD and Learning Leadership Organizations, and an MED? Andy: [02:09] Right, with a specialization in school counseling. John: [02:11] Yeah. This is really exciting. Outside of the School of Nursing, who has had online programming for quite a long time now, this is the first venture any of our other schools have done. We’ve done MOOCs. We’ve done specialization. We’ve done little side projects, non‑degree programs. This is a big step. Can you tell me a little bit about why and why now? Andy: [02:35] My background, for the listeners, who I am sure are fascinated to hear this, is my PhD is instructional technology. One of the things I am very interested in understanding is how we can use technology to make learning more effective, more efficient and more accessible. [02:50] When people think about the accessibility of instruction they oftentimes think about how can we work with students who have physical or cognitive impairments, but another form of accessibility has to do with geography. [03:01] We oftentimes talk about bringing the classroom to Vanderbilt and then taking Vanderbilt out to the world. This is a way for us to extend our reach as an institution to provide our Vanderbilt education for people who don’t live or can’t come to campus. [03:16] Online education really is going to be an enormous part of how people learn in the future and Vanderbilt is going to help lead the way. Catherine: [03:25] I would only add that how, when and where people are learning is changing. As a college of education that has a really long history of preparing leaders for the vast constellation of institutions of which human learning takes place, it makes perfect sense that a leading school of education would lead Vanderbilt in this direction in offering online degree programs. Paul Speer: [03:49] Yeah, I would say the same thing, just that higher education is changing in so many different ways. Vanderbilt is going to stay a very robust, well‑regarded, nationally‑ranked university, and we’ll still have all those online programs. [04:05] But there are so many different venues and channels and mechanisms through which learning is happening now, and we’re investing our energies and making sure we understand how that can happen and for the reasons we’re all talking about. Andy: [04:20] Yeah and I think what’s an important factor in the equation as well is the partner that we’re working with, a company called 2U. 2U was founded in 2008 and they’ve been in this field of working with universities to provide degrees, so they’re not like other programs that offer online degrees where they do it. [04:39] They partner with institutions like Vanderbilt. Other partner universities include Yale, Berkley, Georgetown, USC. Highly regarded institutions. The time was right where I think with the use of technology, you want to be out on the forefront, but you don’t necessarily want to be on the cutting or bleeding edge. [05:01] 2U has experience over the last 10 years in developing these types of programs with partners. It’s just now, we’re going to be the first working with them in these particular areas. John: [05:14] I want to follow up on this and combine something Paul said and what you just said. Paul said Vanderbilt will maintain its reputation, right, as a world class university. You talked about the partner being important and you named other top tier universities. [05:30] There’s often concern about the difference between a residential program and an online program in the quality of the education there. Can you talk a little bit about how you maintain the quality? [05:40] I’m assuming you want to keep at least the same level of quality in your program. How do you maintain that? What are the ways of approaching it? What are the challenges that you face in putting a program online? Catherine: [05:51] One of the really appealing parts of working with a company like 2U is the importance of having both asynchronous learning experiences for students in online programs as well as synchronous learning experiences for students in programs. [06:05] That means that, like most online degree programs, we’re offering taped sessions where faculty in advance prepare lectures, but also the requirement that every week, students are coming together in an online classroom environment led by leading faculty to process that learning. To have discussions. To have the kind of learning experiences that really are the hallmark of our on campus programs. [06:30] That learning is also prioritized by having annual immersions where people come to Vanderbilt. The students in the program come. They meet with one another. They meet with their faculty to have the face to face interactions that are also such an important part of what we know about learning. Andy: [06:45] Right, and the courses, for the most part, are the same. It’s the same instructors, it’s the same content. The duration of each term is about the same. There’s the same requirements to graduate as for on campus students. [06:59] The students that are coming here, that we’re going to be admitting, will meet the same standards. We’re bringing in the same quality of students. They’re being taught by the same instructors going over the same course content. [07:11] In my area of interest, instructional technology is looking at how we can make learning online as effective or, I believe, more effective than learning face to face. What’s interesting is you look at principles of instructional cognitive psychology and one of the things that we know for certain is that sometimes it takes multiple times to review content to really understand it. [07:31] Well, think about if you are an on campus student. I get to hear Paul Speer’s lecture one time. I take notes and I can go back and review my notes. But if I’m looking at a recorded session of Paul presenting something, I can look at that any time that I want. Maybe during the time of day when I feel like I’m most alert, most awake, I can review that material more than one time. [07:50] With some of the learning technologies that are incorporated within the learning management system, there’s opportunities for adaptive learning. Imagine quizzes that can tell you whether your answer is right or wrong or have you go back and review material based upon your responses. [08:03] I think that 2U has done a great job of incorporating technologies that implement principles of cognitive psychology to make learning more effective. Then the idea of being able to learn whenever you want and see material multiple times is going to help also to increase the quality of instruction. Paul: [08:18] The three of us have had the luxury of seeing how 2U structures their courses at other places. There’s the asynchronous learning so you can see that multiple times, but then we’ve been able to peer in and see synchronous learning and it’s amazing how students in dispersed geographic places who are coming together at the same time get to know each other. [08:38] Now it’s amplified by coming to these immersion experiences, where they really do get to go out to have dinner or a cup of coffee with others, but they already know each other through meeting regularly in small groups with a faculty member. It’s kind of impressive to see it actually unfold in practice and it is effective. John: [09:02] I’m going back to a question about the partnership with 2U again because you mentioned some of the technologies they’ve created, Andy. How much of the program is Peabody in and what is 2U’s role? If you could clarify questions like admittance, the creation of tools, lectures, etc..
Andy: [09:22] All right, if we were to put it into two big buckets, what 2U does is they really have the backend learning management system. They’re experts in video production. [09:31] For instance, Andy Finch, who is going to be teaching one of our first courses and who really is the program coordinator for the school counseling program, is right now videotaping his programs in Maryland at their studios. [09:46] They’re experts in video production and then taking that content, putting it online and managing it. They also have their grade book, which will be online. They have tools for plagiarism detection that is available to us. They have quizzes. Think of them as sort of the technology backend. [10:02] When you think of what Peabody is, it’s really the essential elements that Catherine talked about. Who are the professors? What’s the content? How’s that content delivered? Not online versus on campus, but what questions do you choose to ask? How do you respond to students? [10:16] How do you break students up into small groups? What are they going to do in those groups? When they come back, how are you going to make sure that they engage with each other, sharing their ideas? Everything has to do with instruction and how you present the information. 2U has a phenomenal team that’s going to be helping us to market this program. [10:34] Doing things, this is very nerdy, but search engine optimization and buying ad words and bringing students in. We are 100 percent responsible for reviewing the applicants. We choose the criteria by which we admit students and don’t admit students. Absolutely, they’re going to help us out with marketing, try to bring as many prospective students to us as possible. [10:53] We’ll make choices about who’s going to be in the program, then we’ll instruct them and ultimately we confer the degrees. They have the exact same diploma. They have the exact same email address. The transcript looks exactly the same. These are Vanderbilt students. Whether they’re on‑campus or online, they will be treated exactly the same. [11:22] When it comes to participating in student governance, coming to book clubs or watching people who we bring in as outside speakers, that type of programming that creates a sense of community around this program will be available to our online students as it is to our on‑campus students. All that’s Vanderbilt. John: [11:42] That’s great. It really is. Can one of you walk through the steps? I know you’re right now working on the first courses, a whirlwind of activity because this happened pretty quickly. What are the steps if a faculty member’s facing this? What are the steps you’re going through to get the first courses put up online? Andy: [12:06] I began the process to teach a course in our program, a course in research methods, and then I was provided the opportunity to be the associate dean for this program. The administrator responsible took me away from this, but I worked with the 2U team to identify…So in the program sequence, we identify what the course is. [12:26] We talked about how many weeks we’re going to have. It’s going to be a 14‑week course. One of the things that you think about as an instructor is, well I’m going to have about half my time which is going to be material that is, as Catherine mentioned, asynchronous. [12:39] I want you to come online watch videotapes of me, go off to look at other online resources, read about something, take a quiz, maybe write up a reflection, things that you can do any time you want. You can be sitting at a Starbucks, you could be sitting at home, your kids have gone to bed, late at night at the kitchen table. [12:54] Then there’s the synchronous component which Paul mentioned. That’s using video technologies like Skype, but we’re using Adobe Connect. You’ll have sort of a Hollywood Squares screen where you have say 12 other students and the professor who are all video conferencing at the same time. [13:12] One of the things that you think about as a professor is what am I going to do during that period of time? All of this goes back to good quality of structure. What’s the hook? How do you bring people in? What is the objective you have for it? How do you ensure prior knowledge? How do you present the content, have people break up into groups? [13:26] What faculty members think about is, “What do I do to present the content in a way and allow students to engage with it in a way that helps them to learn it?” What’s interesting is there are different things you can do online than you can do face to face. [13:43] I think you could call it a challenge or an opportunity. Having professors take their on‑campus courses and put them online really requires them to think through all those instructional decisions that they made a few years ago when they created the course. [13:56] For me, it was kind of exciting, the idea of going back and refresh a course. I think all of us would enjoy doing that if we just had the time to do it. This gives them the opportunity to do that. John: [14:04] Are any of the three of you teaching in the fall? Andy: [14:08] No. We have Brad Erfurt who’s a recent addition to our school counseling program will be teaching, and Andy Finch. We’ve got sort of our two rock stars in the program who are teaching. [14:20] Then in the leadership and learning organizations we have Chris Quinn Trank and David Laird, another two other highly respected, highly regarded and successful faculty members. The great news is we have people who are open minded, who are great instructors to engage in this first wave in instruction. John: [14:37] Well, will the three of you teach at some point in the program? Andy: [14:40] I’d like to. John: [14:41] You’d like to? Andy: [14:41] If there’s an opportunity. Catherine: [14:42] I don’t think so at this point, but it’s possible. I want to talk back actually to the point that Andy made a moment ago. I don’t think it’s possible to overstate the change that this required and how faculty are thinking about the work that they do. [14:57] Faculty think about universities as brick‑and‑mortar institutions. They think about teaching in a classroom environment and moving to an online modality creates challenges, but to Andy’s point, also lots of opportunities. [15:09] I would just add to Andy’s point about developing these courses online has presented really fun, I think intellectual, puzzles for our faculty in thinking about how they can bring a fresh pair of eyes to their courses. [15:22] Approach it more creatively, pedagogically, and having a team at 2U who provides the instructional design and support to help them think about adapting to an online modality. The sea change has been required of faculty to think about these things differently is pretty significant, but has created some really fun opportunities. Andy: [15:39] Yeah and it takes a leap of faith. When somebody says, “Do you want to teach your course online?” a lot of people think “I’m gonna stand front of a green screen and lecture,” which would be the worst thing possible. [15:49] That would be the kiss of death for, I think, an online course. To sit back and think, what am I going to do different and how will I do it if I have these two different sort of modalities of synchronous versus asynchronous? How am I going to do it? The great news is ‑‑ and you mentioned this ‑‑ is that 2U has done this before. [16:05] They’ve created at least 500 different courses so the production team who comes in, there are experts in pedagogy and there’s experts in video production. [16:14] There’s experts in audio, there’s experts in content curriculum, and there are people who will go through and help us take images that we may have pulled from Google, dropped in our slides, and make sure that we have copyright clearance on those kinds of things to help us clean those things up. There’s a whole team on the back end who are really helping us to make us the very best that we can be. [16:47] How did you choose the faculty who are teaching? You talked to these being some of your rock‑star faculty. Is this true throughout the program? That sort of question. Paul: [16:57] I can speak to this school counseling and Catherine may talk about her doctoral program but we have a lot of faculty who explored this option, an alternative. At first, I think there was resistance. [17:50] At least for us we’ve got faculty saying, “Yeah, I would like to do this.” If you’d asked me that maybe four months ago, I’d have said I don’t know, but that’s not the way it’s been. I think it’s because of the experiences that Andy and Catherine are describing. Andy: [18:29] One of the other benefits is once you create a course with her arrangement with 2U, the instructor has complete access to that content. If I create some really compelling, dare I say, videos and I’d like to bring those into my classroom and use it, well I have every right to do that. The great news is it’s really high production quality. [18:49] So if you’re willing to invest your time into re‑conceptualizing your course, what you get out of the course is compensation. We’re paying our faculty to do these things, but you also have access to resources that I can use on my on‑campus course. There’s no doubt in my mind that once you create an online course, your on‑campus course is going to change as well. Catherine: [19:08] I think beyond the degree program, we’re also tapping into some momentum in higher education with digital learning. John, your office is a great example. All these exciting developments in the digital humanities. I think we’re also tapping in to the excitement and enthusiasm around those initiatives. [19:23] Also, for the ED program, we took it as an opportunity to rethink what we’re doing in our on‑campus program, and expanding the curriculum to reach a broader range of professionals working in a broader range of organizations. [19:35] It also gave us a great opportunity to do something that we’re not great at sometimes, which is getting outside our departments silos and partnering with faculty in other departments, to have truly an interdisciplinary program that brings the best of Peabody together in a degree program. [19:52] Our colleagues in teaching and learning who are offering courses in learning and design and how to think about the context in which human learning takes place differently. Our colleagues in psychology who are bringing some expertise in cognitive psychology and learning. [20:07] It’s been exciting for us to step outside our comfort zone, not just in the modality, but also in the way that disciplinary knowledge is typically organized and an opportunity and a program like this to transcend those artificial boundaries in some ways. John: [20:23] Following up on that, when you were talking about moving outside of your modality, you have faculty I know that study multi‑modality. Did you have folks who were already sort of prepared, not for the specific platform, but prepared psychologically to go forward with this? Paul: [20:41] Well I would say Andy, as much as anybody… I think there are probably people in different departments that are all looking at different aspects of this. At Peabody, there’s lots of scholars that are looking into that. I think a lot of the technology transfer and the learning science and stuff that you’re interested in is probably the most applicable. Andy: [21:01] I appreciate you saying that, but I think that for other faculty it was a leap of faith of sorts. We really need to give some real appreciation and thanks to the team that’s teaching in the first wave and even in the second wave, because this is new. [21:14] This is new for the University, this is new for a lot of people, and to take time out of their schedule… and it was really unanticipated, right John? As you recall, it was February when we said this is something that we’re going to do. [21:41] There’s a lot to be said for the spirit of cooperation and the desire for people in both of these departments to make this a success. John: [21:51] Let’s talk about the speed with which this came about for just a minute, right? I want to think about the institutional relationships and how they come to bear educational technology. [22:02] At my office’s level, we ended up in a conversation with 2U, which excited us more than we expected. It brought the opportunity forward to a couple of schools to look at. Can you take it from there, why this unfolded far more quickly than I expected? What were the forces that got this moving forward the way it did? Andy: [22:27] Well, some of this is above my pay grade, so I would throw this question right back at you, but I think there’s a number of different factors that play into why do we want to launch in September than January. [22:40] I think that once we made the decision to launch in…Basically August 24th is our first day of class, when we’re going to get started. We had a really daunting task ahead of us because we’re asking everybody who’s involved in not just instruction, but the business of making a university work. [23:18] We don’t have the luxury of a short summer, so we have to work with a registrar to do that because if we have equal length terms, that makes it easier for instructors to create it. It also makes sure that students have access to federal funding, which is a critical issue. [23:32] We have people in the registrar’s office. We have people who are responsible for financial aid. We have people responsible for programming. How are we going to provide student services, mental health services, other kinds of services. [23:47] Across the board, we had to ask every single faculty member and staff member to rethink everything that they’ve probably been doing probably the same way for 20 years to think about we need to do it differently. The thing is, the pace of change was, we need to make this decision by next Wednesday, not like this is something we’re going to roll out next year. [24:06] I think one of the areas of friction that’s been challenging for us, but I think this is what happens when you want to try to do something sort of bold and audacious and then do it quickly is…Working with a company like 2U, it’s a typical cooperation that is driven in part because they’re publicly traded by quarterly earnings statements. They’re used to making decisions very, very quickly. [24:24] We have an institution like Vanderbilt which has been around for over a hundred years and we’re used to doing things on a…I don’t want to say glacial, but on a slower, more thoughtful pace. [24:33] Then when the two come together, one of the things we have to do is meet on a weekly basis and talk about making things happen quickly. That’s where there’s, I think, a source of tension and also a source of initiative that’s driven us forward. Catherine: [24:47] I would add to Andy’s point, to the initial question John that you asked, which is Vanderbilt saw this opportunity, engaged with a couple of schools. [24:55] I think we had a dean who stood up and said it makes perfect sense for a leading college of education to take up this charge, to rethink teaching and learning in its most basic forms and step into this world of online learning. It made perfect sense that the School of Education would take up this charge. [25:30] Just about every single hand went up and she looked around that room and thought to herself, “We have a little bit of catching up to do.” This is something that’s happening all around the country. I think it’s surprising to people but there’s a number of highly regarded institutions, I named them before, who have online degree programs. [25:48] I think Vanderbilt may have timed this out just right. Not so early that we truly are on the bleeding edge, but not so late that we’re late to the party. We’re working with a partner who’s been around long enough that they have tools and experience with some maturity in working with other programs. [26:05] I think it’s a convergence of a lot of different things that said let’s start doing this now and let’s move forward without too much hesitation. John: [26:11] Talk to me a little bit about scale. When we talk about online programs, people sometimes envision MOOCs, which have thousands and thousands of people sign up. Some schools, especially some state schools, will have courses, summer school courses, other courses to lots and lots and lots of students. What kind of scale do you expect? Andy: [26:30] Well, what’s interesting is on a class by class basis, it’s going to be a dozen, 15 students in each section. If you’re a student who’s applying to Vanderbilt University and you’re thinking, “I’d like to be part of this online program,” you’re not going to be in a virtual classroom with 300 other people, or it could be thousands of people in a MOOC. [26:49] You’re going to be in a very small group of people and you get to know them very well because you’re meeting them on a weekly basis. That being said, we can offer more sections of that course because there’s some scales of economy when you have recorded content. We’re anticipating that this program is going to grow to the same size and larger than our on‑campus programs. John: [27:10] But the students will experience it still in, you’re saying, small classrooms. Paul: [27:17] The thing is that the direct experience of every student is a sample of about 12, 15…Does it even get that high? 12 to 15 who they will get to know, and then occasionally these immersion experiences where they come together. That’s as big as it goes for any enrolled student. John: [27:37] What are you picturing with the immersion experiences? When they come together, what will they do? Paul: [27:45] Just briefly, I know some of that’s being designed right now. We’ve been having meetings, talking about those very kinds of questions, and it’s a very intense multiple day thing. [27:56] We’ve talked about how do we maximize the connectivity among students? Bringing in meals, having coffee breaks, getting people to do social things afterwards. I know that some of those kinds of questions are going on. I think Catherine may know more about some of the actual content and exercise. Catherine: [28:16] Just to add to Paul that they are still in the development phase in thinking about what the immersions will look like, but we see it as an opportunity to bring together students. [28:23] These are professional programs. The EDD is designed for working professionals, so people that have full time jobs. The idea that these immersions will be networking opportunities, we will partner with external organizations and practitioners, do some case space analysis, some group work and teamwork to take advantage of being face to face in ways that are unique and innovative. [28:49] More to come on the immersions, because we’re really excited and thinking about them and their possibilities. Andy: [28:54] Yeah and we’re going to leverage the experience that we have at Peabody. So we have the Peabody Professional Institute. Patrick Schuermann who runs our master’s degree in Independent School Leadership. [29:03] These are programs that are hybrid where there is some online components, but then we’re also bringing people together. We have real expertise in how to bring people together for…I’ve taught weekend courses. We’ve all taught these courses where it’s four hours on a Friday, six hours on a Saturday and we do it three times per semester. How do we do that? [29:20] We’re leveraging the expertise that we already have at Peabody. We have the Humphreys program where we bring people in for a year. How do we do those residential sort of short, quick type of things and then do it on a scale of every single term? Essentially, we’re going to have these immersions. [29:36] Students who apply to the program and are admitted both on our EDD and our master’s degree program are going to have basically an immersion per year. They’ll be about three or four days long — I know we’re still talking about exactly the period of time — and it’s going to be the kind of instruction that’s optimal for face‑to‑face instruction. [29:52] For instance, I’ll just give one example. In our Master’s degree program, it’s going to be group counseling. You can do group counseling online, but the idea of looking at someone face to face, reading their body language of their whole body, that would be something that we really want to put into a residential or a face‑to‑face immersion. John: [30:12] Do you have any expectation yet of where most of your students will come from? Andy: [30:19] Well, according to 2U and the statistics of programs that have been started to date, surprisingly to me, was about two‑thirds of the people come from the region. [30:28] I think we might see that where it’s similar to our undergraduate programs here. We see a lot of representation from the southern part of the United States. The reason is ‑‑ they mentioned ‑‑ is that Vanderbilt has a recognized name in the states that surround it. [30:42] Not to say to somebody who lives s in Alaska or lives in Jerome, Idaho hasn’t heard of Vanderbilt University, but everyone’s heard of the local university or the biggest name university in the area so I think we’re going to see a center of gravity in Tennessee and in our region, but we’re going to be pulling in people from all over the United States, of course because it’s an online program. Catherine: [31:02] I would say an internationally ranked institution, so having Vanderbilt is a real draw for students. An early indicator suggests that they’re coming from all over. We’ve actually had interest internationally. It remains to be seen where they’ll come from. Even as 2U always have said, this regional draw is something they had seen quite often. Catherine: [31:26] They have. Yeah. There’s lots of enthusiasm and excitement. These have just launched and so I think early returns suggest tremendous interest. We’re really excited about it. Catherine: [31:42] Completed applications already. Catherine: [31:49] They’ve reached you John. John: [31:49] This [indecipherable] gets to me. One of the things I’m always interested in when you’re introducing something — I say interested in sort of a skittish way — I’m interested in when you’re introducing anything new to faculty is the types of pushback. [32:06] You’ve mentioned some. Just some of this pushback would just be, “This is new. This is different. We want brick‑and‑mortar education.” What are some of the other issues that arose in discussions with faculty about doing this? A faculty member can be positive and good‑hearted and still have real legitimate concerns. Catherine: [32:24] I think at a very basic level, people go into academic life, they become faculty members because they love teaching and they associate teaching with the wonderful relationships they form with their students. [32:38] Those relationships for most of us tend to happen within the confines of the classroom. The very idea of any kind of threat to eroding what most of us love about teaching — which is these wonderful relationships with students, the spontaneity that emerges in a classroom, the places that you can go and sometimes places you can’t even anticipate when you start a class — those are the things that we love about teaching and any threat to that was something that was hard for faculty to wrap their head around. [33:04] So overcoming those ideas was something that was hard. Looking at the 2U model and these possibilities for those things, and the synchronous environment was something that really helped at least to make that leap initially. [33:36] But I think there was a concern that it would tarnish the reputation of Vanderbilt for us to go off and do this online degree program. But I think the question you asked earlier about quality ‑‑ I’m not going to go back and address all those points ‑‑ it’s the same faculty. They’re the same courses. [33:48] We have a high standard of excellence for the students that will be admitting to the program. This is going to be accredited by SACS. We have the exact same accreditation requirements and evaluation standards that we have to go through and they’re looking at this with a very keen eye. Early concerns regarding quality would be something people that would be concerned about. Paul: [34:11] Quality was a definite key point for faculty because they were concerned. “This is just going to be…” and it’s not. I think people get that, so there’s much more acceptance at this point. John: [34:30] When we first started at looking at 2U, at a general level, I talked to a lot of the other universities who had worked with them. I know that as this moved on, you’ve talked to colleagues across the country as well, doing similar types of programs, for advice. Andy: [35:04] The first thing is every year, 2U has a symposium that they hold. This year, John, you and I went with Catherine and with Andy. I was positively inclined towards the idea of online instruction, but one of the things that really lit a fire underneath me was meeting the faculty members, the administrators from other programs. [35:23] I’m going to use this as a case study when we talk about the stages of grief. There’s denial, there’s anger, there’s bargaining, depression and there’s acceptance. [35:47] I think an acceptance that this is going to be a tough process for a lot of the faculty. There are going to be some who are going to be the early adopters. They’re going to want to jump on board. That’s great. Tap into the energy. [35:56] There’s going to be others who are sitting on the fence. You’re going to want to bring them into the fold. There’s others who are going to resist for some period of time, but these are the kinds of things that you can anticipate happening. [36:17] I would also just add I’d probably go a little bit slower. I think we’re probably breaking some record. I don’t know who in the Guinness Book of World Records keeps track of it, but I think we’re going pretty quickly. [36:27] I think having a little bit more time to be thoughtful and deliberate about some of the decisions being made, bringing people on board, would be another piece of advice that I would give. Paul: [36:40] I don’t have anything more than that. That’s very accurate. The stages of grief analogy, it is very accurate. Part of what’s been interesting is I know our faculty went through that. People on board…as new people have come in to the program, I see them recapitulating that whole process again themselves. It’s interesting. John: [37:07] I asked you that question not just because I’m interested in what you would say, but because I’m expecting that in the next couple of years, not from other institutions ‑‑ although that will happen as well ‑‑ you’re going to have the deans of other schools here at Vanderbilt come talk to you about what you did, how this went, etc. Andy: [37:24] I bet. Suppose that Engineering or Arts and Sciences pick it, then Vandy comes over and says, “You’ve had so much success here at Peabody,” and it’s going to look great. Once we’re up and running and you look at it at the outside, it’ll be, “Wow, this must have been really easy.” Yeah, I think those will be fun conversations to have. John: [37:41] One of the questions we ask on this podcast, I’m going to ask each one of you. We’ll start with Paul, then go to Andy, and then back over to Catherine. What is your favorite non‑digital or analog educational technology? Paul: [37:59] I’m going to stick with the book. I still like a book in my hands. I can make notes. I know it’s old‑fashioned, but I adhere to that. I’m sticking with it. How’s that? Andy: [38:16] When I teach courses in structural design, I always say that instructional technology are tools and techniques to help people to acquire, attain and retrieve news, knowledge and skills. I’m going to go with techniques. It’s not necessarily technology in the terms of something that you can hold in your hand but specific instructional strategies. [38:49] Putting the student’s name on the back of the question as opposed to the front of the question makes sure that every student during that period of time is thinking, “Oh my gosh, he’s going to call me,” and they’re trying to retrieve the information. [38:59] My favorite non‑ digital technology are specific techniques you can use for asking and answering questions and facilitating learning. Catherine: [39:07] I’m going to be boring, but I’m going to repeat Paul’s. I love a book. I love how they smell. I love how they feel. If I could add another, I’ll cheat a little bit because you said educational technology this time before you said technology. [39:23] I love a vinyl record. I love how the needle hits the record and how it sounds. Nothing digitally can reproduce that. A good vinyl and a book and I’m happy. Andy: [39:34] That’s multimedia instruction. John: [39:38] OK. Before we go, do you have anything else that you’ve thought of ask…I’ve asked you several questions. Is there anything else you would like to add about these experience or about these programs. Andy: [39:49] If you want to learn more about the programs, go to peabodyonline.vanderbilt.edu. John: [39:53] A little bit of marketing there. John: [39:57] All right guys, thank you so much for being here. Paul: [39:59] Thank you, John. Derek: [40:02] That was Andy van Schaack, Catherine Loss and Paul Speer from Vanderbilt University’s Peabody College of Education and Human Development. Thanks to John Sloop for the interview. Special thanks to Rhett McDaniel for his audio production work on the interview. [40:15] Andy made a comment on the interview that struck me. He said that when you tell some faculty that they’re going to teach online, they think of green screen and lecture. That is they imagine what I describe as the popular MOOC model of online teaching, lots and lots of video lectures. That’s probably true of some faculty these days. [40:30] There’s a much longer history of teaching online that uses videos sparingly, focusing instead of interactions with students through writing, such as discussion boards and written assignments. A lot of institutions, that’s what comes to mind when you mention online education. [40:44] I think both models actually have their drawbacks. The MOOC model can lack the kind of feedback and social interaction that many learners need. The more traditional model can feel too much like busywork sometimes. [40:55] I’m excited about the model Peabody is attempting in partnership with 2U, something that involves discussions and assignments, but also video lectures and, perhaps most critically, synchronous video classroom experiences. [41:06] This is one of the reasons I’m so interested in educational technology more generally. When we have more tools in our toolbox, it opens up new possibilities for learning and teaching. Sure, face‑to‑face teaching can be great and online teaching can be great, but why not give ourselves access to all the tools and find the best mix for our particular teaching objectives? [41:26] At its best, educational technology is additive. It doesn’t replace what we’re doing as teachers. It builds on, enhances and expands our capabilities. [41:33] As I mentioned at the top of the show, this is our last episode in season two. We’re going to take the summer months to stock up on interviews so we’ll be ready for season three in August. Look for updates on our website, leadinglinespod.com, or on Twitter where our handle is @leadinglinespod. Feel free to subscribe to our podcast from iTunes or your other favorite podcast app. [41:53] If you like what you hear on the podcast, please give us a review and a rating on iTunes. It helps other listeners find the show. Leading Lines is produced by the Center for Teaching, the Vanderbilt Institute for Digital Learning, the Office of Scholarly Communications and the Associated Programs for Digital Learning. This episode was edited by Rhett McDaniel. [42:10] Look for new episodes the first and third Monday of each month when we return in August. I’m your host, Derek Bruff. Thanks for listening.